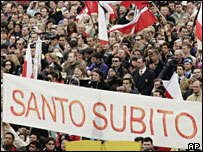 The extraordinary number of people who converged on Rome after the death of John Paul II startled even the Vatican. They crossed continents and then waited patiently for hours to file past his body and pay their last respects. In death, the Supreme Pastor of the Universal Church acquired a new title for the modern age: the People's Pope. And by the time of his funeral, it was clear the pilgrims had another title in mind. "Santo subito!" chanted the crowds in St Peter's Square. "Make him a Saint now!" The Vatican is not accustomed to moving so quickly, but if the faithful have their way, John Paul II will achieve sainthood in record time. When Pope Benedict XVI was elected, he promised to be a "listening" Pope. He must have realised the clamour to recognise the sanctity of his predecessor would not go away. So he has now given the green light for John Paul II to be considered for beatification, the first stage in the process that leads to sainthood. At one time, the process of creating saints took decades, if not centuries. John Paul II dramatically speeded up the process, but left some critics wondering if it had become a little too easy. In the case of Mother Teresa, who was beatified in 2003, the late Pope decided to waive the customary period of five years that is supposed to elapse before the process can begin. This delay was originally intended as a way of preventing decisions being influenced by strong emotions following the death of the person concerned. But now the fast track process is being adopted again, and this time it is likely to be even faster. So why is there such a rush to make John Paul II a saint? There is no doubt it will be a hugely popular move throughout the Catholic Church. Even those who disagreed with some of the Pope's views accept that he was a remarkable man, who had an extraordinary impact on the Church and the wider world. One of the features of his lengthy papacy was the way he revolutionised the whole process of making saints, to make them more relevant to the modern world. He reasoned that it would be easier for Catholics to identify with the lives of people from their own times - and from their own lands and cultures - rather than remote figures from past centuries. 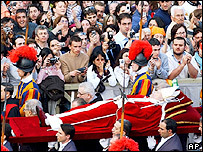 John Paul II not only created a record number of saints, he frequently performed beatification and canonisation ceremonies during his overseas visits. Pope Benedict hopes that by putting his predecessor on the road to sainthood, it will be an inspiration to the faithful. Given the depth of feelings for John Paul II, such a move would be seen by the Church as spiritually uplifting but making him a saint could also bring earthly benefits. The scope for special issue stamps and coins celebrating the new status of John Paul II is obvious, although the Vatican would be horrified by any suggestion it was cashing in on the former Pope. But the demand for religious memorabilia is strong, from the faithful and from collectors. 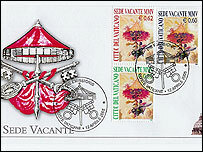 After the Pope's death, stamps and commemorative covers sold out rapidly, and were soon being traded on eBay. The souvenir shops and trinket sellers around St Peter's Square will no doubt sell countless "St John Paul II" mementoes to the pilgrims who come to Rome. Of course, this is a little premature as the Vatican cannot ignore the requirement for the candidate's life to be scrutinised. There may no longer be a Devil's advocate to look for flaws in the person's character, but miracles are still required. 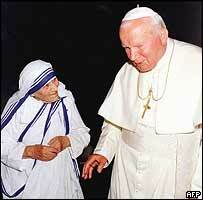 One is needed for beatification, and another for canonisation. So although John Paul II is on the fast track to sainthood, the proper process still has to be followed. However, given the number of people who have already attributed miraculous cures to the late Pope, it is not likely to be a problem. The People's Pope will surely become the People's Saint. What should the new pope do?